The National Democratic Congress (NDC) has called for the arrest of Dr Mahamudu Bawumia, vice presidential candidate of the opposition New Patriotic Party (NPP), for his recent exposé about the credibility of the voter register. Speaking to the media yesterday at the NDC headquarters in Accra, the party’s General Secretary, Johnson Asiedu Nketia, rubbished Dr Bawumia’s presentation to the Electoral Commission (EC) concerning alleged registration of foreign nationals by the commission. He described the claim as false and fabricated, for which he (Bawumia) should be arrested. He insisted that the evidence presented by Dr Bawumia was “photoshoped” and could only be allowed on social media and not serious institutions like the Supreme Court and the EC. The NDC in recent times has turned its attack dogs on Dr Bawumia, trying to tarnish his reputation despite a series of predictions he made about the economy that came to pass. At a retreat held at Royal Senchi, Akosombo last December, Ghanaian diplomats expressed dissatisfaction with the NDC party and government’s response to economic issues raised by Dr Bawumia. According to them, the international community seemed to lap all the analysis made on media platforms by Dr Bawumia, an economist and running mate of Nana Akufo-Addo. The diplomats therefore called for a means of taming his rising star. This might have informed the NDC leadership to make Dr Bawumia their target, making Asiedu Nketia to lash out at the NPP vice presidential candidate. 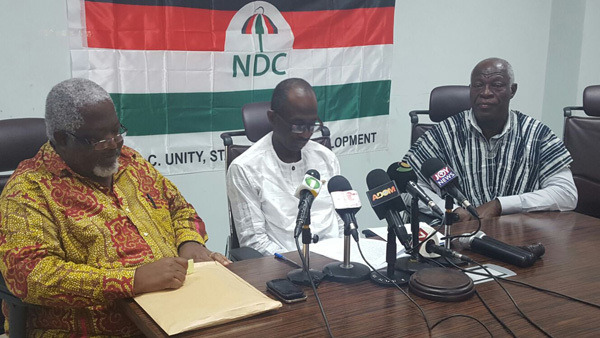 The NDC chief scribe stated, “The NDC condemns in no uncertain terms the fraudulent conduct and calls on the police to immediately investigate the matter. In particular, we are calling for the arrest of Dr Bawumia on the basis that he engaged in falsification and fabrication of public records to deceive public officials. “The reason why we are calling for the arrest of Mahamudu Bawumia is that, I am not a lawyer, but I have heard people say that if you fabricate public documents, if you falsify public documents with the intention of deceiving people, our laws should have a way of dealing with you. “In the Supreme Court they printed fake pink sheets and tendered them in evidence; all that was done was that the Supreme Court rejected them. Nothing has happened afterwards. “And they came to deceive the Electoral Commission again by printing fake Togolese register, put people’s pictures on the register and presented it as Togolese. “How can a PhD [holder] who wants to be a vice president in this country sink that low?” he claimed. Mr Asiedu Nketia, popularly called General Mosquito, alleged that Dr Bawumia in 2013 falsified various documents and presented them to the Supreme Court during the election petition case. “The same man has falsified another document to the EC. “It should not happen when you are presenting evidence to a constitutional body like the Supreme Court or the electoral body and you be let off the hook like that… otherwise our democracy will be in danger,” he said. It would be recalled that Dr Bawumia, former Deputy Governor of the Bank of Ghana, last year made some stunning revelations about flaws in the voter register, providing impetus for various civil society groups to demand a replacement of the electoral roll. Dr Bawumia’s disclosure about the presence of the names of about 80,000 Togolese on the register particularly ruffled various stakeholders. The NDC also endorsed the EC’s decision not to compile a new register ahead of the 2016 elections. 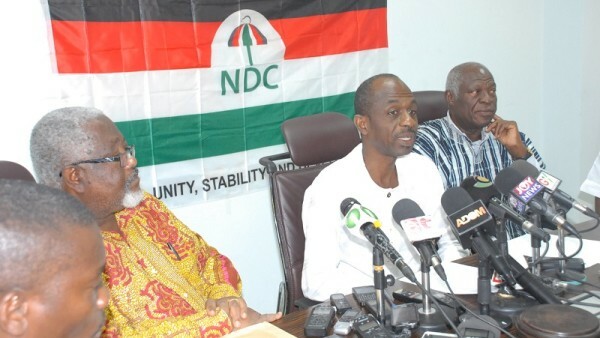 Mr Asiedu Nketia disclosed that EC’s rejection of the demand vindicates the NDC’s position on the subject. The Acting General Secretary of the New Patriotic Party (NPP), John Boadu, in reaction to Mr Nketia’s utterances, rather called on the security agencies to start chasing President John Dramani Mahama. “Why would Asiedu Nketia call for the arrest of Bawumia when there are bigger thieves that have stolen the country’s money walking around…has he forgotten of President Mahama and Alfred Agbesi Woyome?” he quizzed. Prominent among what he described as the gross deceit of the public by President John Mahama was the promise to end the four-year power crisis (dumsor) which has crippled the country’s industrial sector. “Did the president not promise at an IEA forum in 2012 of ending dumsor by 2013? What have we seen on that…nothing…so the president lied big time and must be arrested,” he charged. Mr John Boadu further sought to know if businessman Alfred Agbesi Woyome had paid the fraudulent judgement debt he was asked by the court to refund into the state’s coffers. “The year 2015 has ended so if he has not paid the money, then I believe the NDC could have done more service to the country by calling on the security agencies to pursue him to refund the money and that would have been a more prudent venture…,” he noted. The Acting NPP General Secretary further said that the party had handed over the EC’s letter to its special committee that worked on the voter register and that they would expose the ‘hollow arguments’ of the EC in claiming that Ghana does not need a new voter register at a press conference the party would organize. Mr Boadu was astonished to see the NDC jubilating about the recommendations of the panel of five established by the EC to examine the calls for a new electoral roll since the panel members are not the ones to make a final decision on the way forward. He expressed shock at the conduct of the ruling party.